Today I added the below image and caption to the Trombone History Timeline (17th century, 1601-1625) and the collection, Angel Trombonists throughout History: 104 Images. If you view the interactive map of trombone iconography in Europe, you will notice a high concentration of pins in northern Italy. If you expand the map and select just the 17th century, the cluster in northern Italy will appear even more pronounced. If you browse through those images by clicking on each pin, you will also notice that a high percentage of the trombone images from that time and region are located in sacred settings. 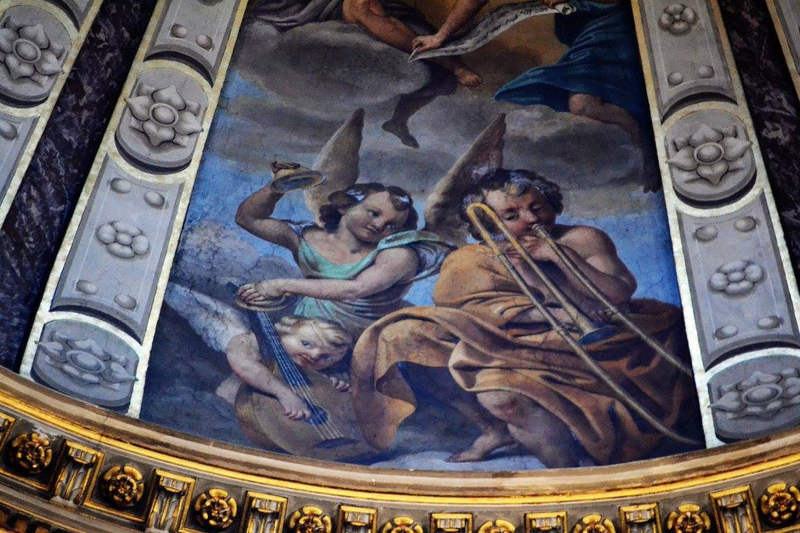 c. 1615—Bologna, Italy: A painting in the cupola of Basilica di San Domenico features an angel-trombonist (see below image; public domain) (special thanks to Kellyn Haley).